Why do I need a security word for RCUpay? 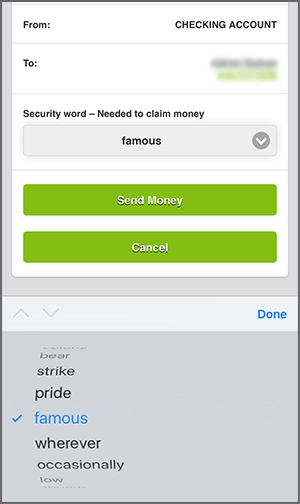 In order to send money, you will need to select a security word from the drop-down menu. Your security word ensures you are sending money to the right person. Once you select a security word, you will need to provide it to the recipient so they can retrieve the money you sent. Please confirm the email address or cell phone number you use to send. Make sure the Receiver knows their routing number and account number when they claim the funds. You don't need their account info, but they will. We recommend using RCUpay for sending money to people you know and trust, like friends and family. 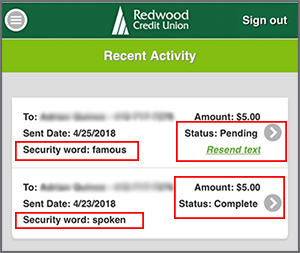 If you forget the security word review the details of your RCUpay transaction in the "RCUpay History". You can resend the RCUpay text by selecting "Resend text" located under the status (see example below). If you send an email the selection will be "Resend email". You will only be able to resend a text or email if the status is pending. Once the transaction is complete resend is not available.